We moved into our home 14 years ago and have never been able to update our kitchen until now! The granite that we have lived with for all these years had an orange and brown color to it. 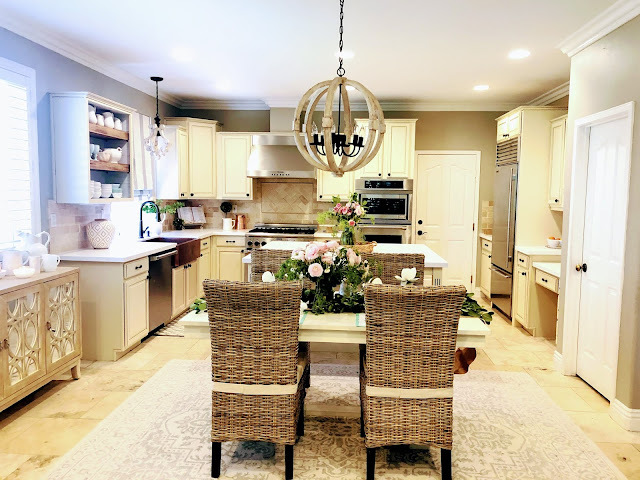 The prior owners upgraded the kitchen with Thermador appliances and a Sub Zero refrigerator which have been a nice addition to the space. We had been wanting to replace the sink and faucet for a long time and so we just decided to do it! It turned out AMAZING! 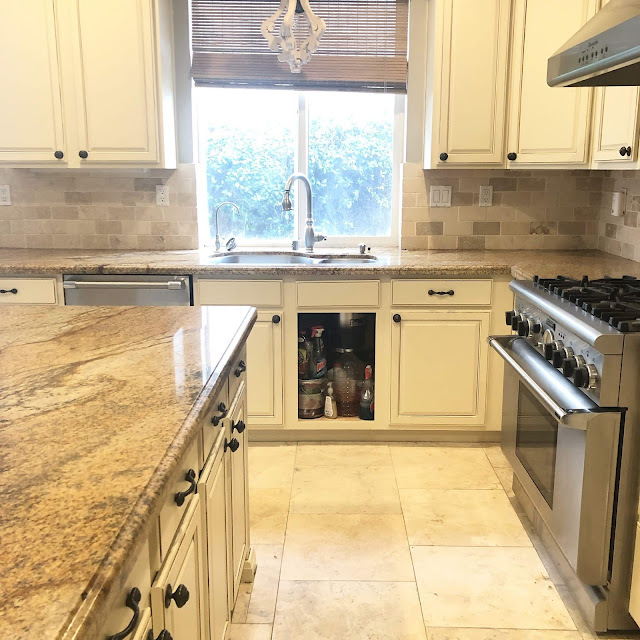 Below are the before pictures of the kitchen. Believe it or not, the sink is a major focal point of any kitchen. I've lived through many homes with a variety of sinks–stainless, ceramic, double sink, single sink, etc. I had heard of Sinkology from friends and knew their brand was reliable and beautiful. 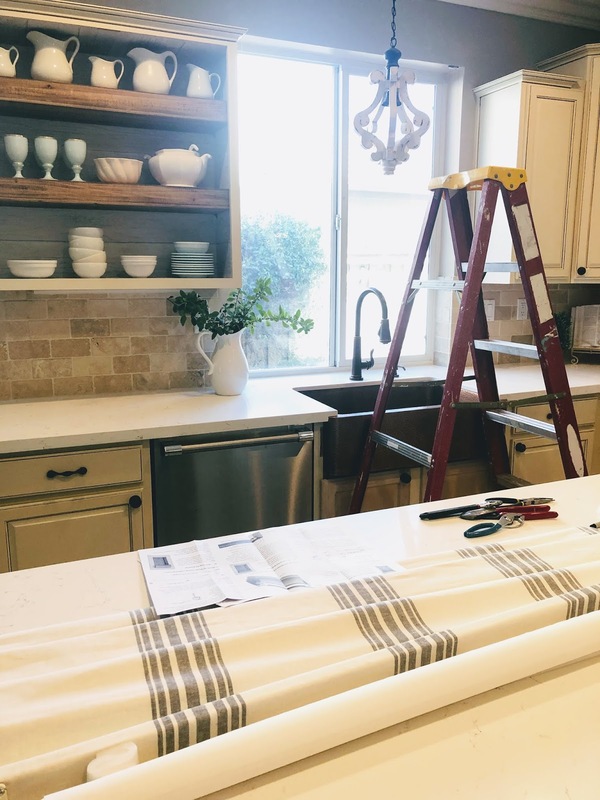 If you're going to remodel your kitchen, don't forget the sink! You spend a lot of your time there (unless you eat out a lot!) and it's not just a place to clean dirty dishes. 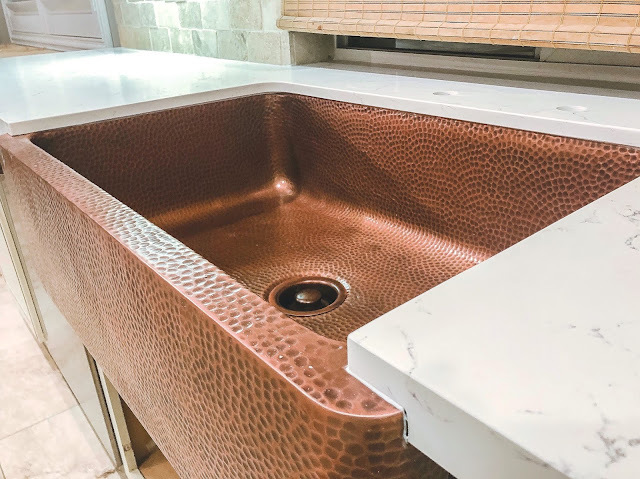 We debated in the beginning to either go with a white farmhouse sink or a hammered copper sink. 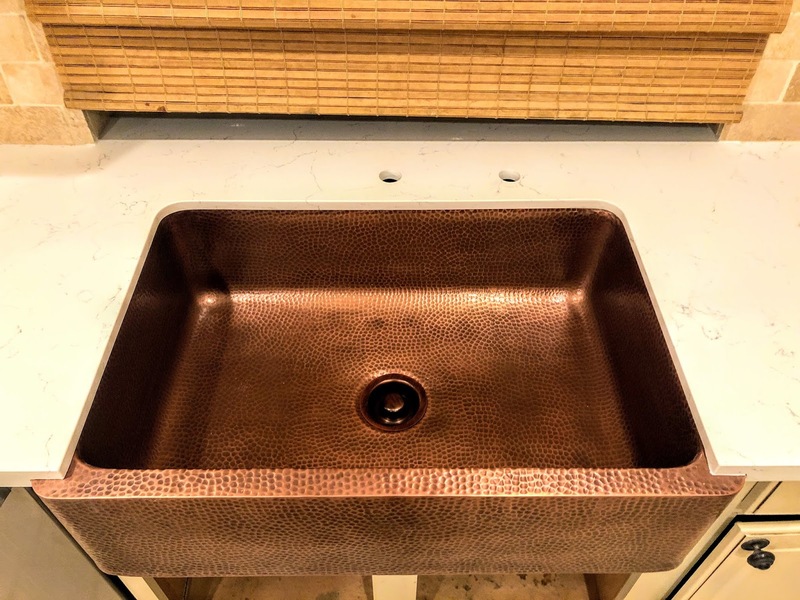 In the end, we decided to go with the Lange Copper Apron Front Sink from Sinkology.com. We felt that is was special and different. I love the fact that it is hand hammered and finished in an antique copper finish with a LIFETIME warranty and you can't get better than that to have a company stand behind its products! The DIY all-in-one installation kit that comes with Sinkology sinks are easy-to-use, SO well packaged, and very professional. You can tell they've put a lot of thought into their product, not just the sink itself, but the entire packaging and installation as well. In looking for a faucet, we wanted a couple of things. First we had to have a beautiful product and second, it had to be a quality product. This Pfister Faucet does both! Quality, performance, service, and affordability are the cornerstones of the Pfister brand. 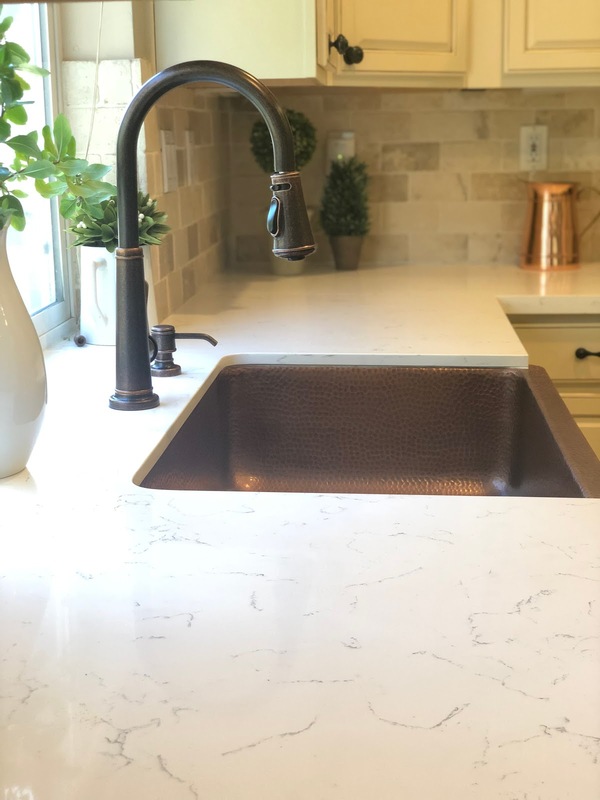 We couldn't be happier with this faucet and how it complements the antique copper finish on this sink. Sinkology has so many options to pair with their sinks, you can mix and match all day long. So if you have a specific style in mind or want something to match your home, you can find it! The short answer is YES. There really are no rules but mixing metals in a space is absolutely fine. The bottom line is you should do what you love in your home. You live there so make it a place that you want to spend time and put things in it that have meaning to you or that you love. Honestly, there is no place I would rather be than in my own home. Taking down the blind made a huge difference in this space. 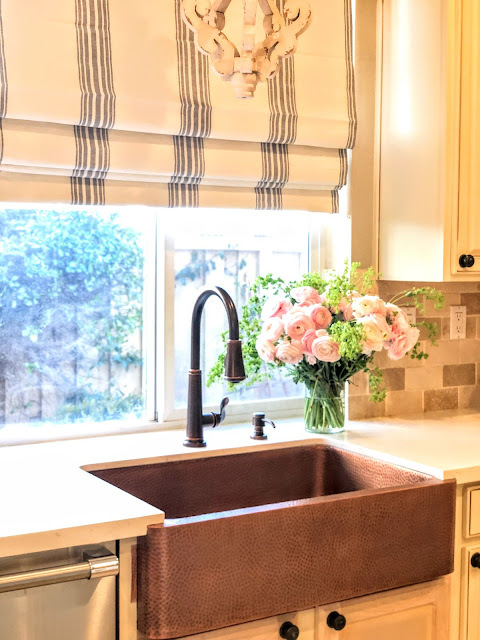 The new blind from Pottery Barn brightened up the space and gave it a more modern look. I took the cabinet doors off and also the post that was in the middle of the cabinet (see next picture that shows post in cabinet). After the post from the cabinet was removed, I added a shiplap peel and stick wallpaper to the shelves that I found at Joanne's. 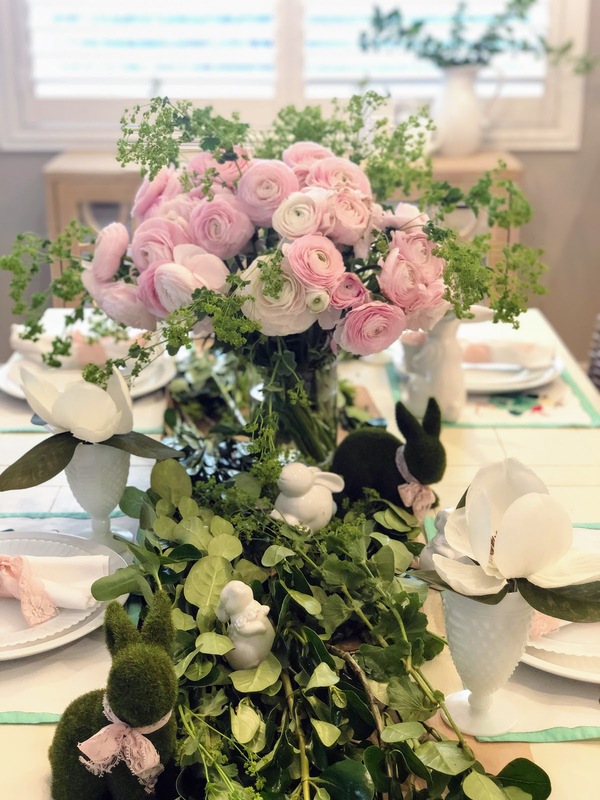 I wanted to tie in the white and cream colors that I have in the existing space. After the wallpaper was applied, the shelves were installed. I picked up the shelves at Hobby Lobby. The shelves had to be cut down just a little to fit inside the cupboard. I had some wonderful friends help me with this project and I could not have done it without them! You know the saying "I get by with a little help from my friends," well it's TRUE!! I have always wanted open shelving in the kitchen and by modifying my existing cupboard, I have it! 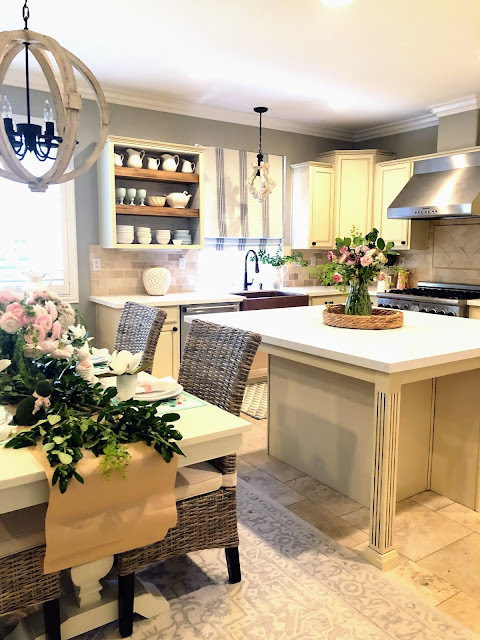 I am really LOVING my new remodeled kitchen! 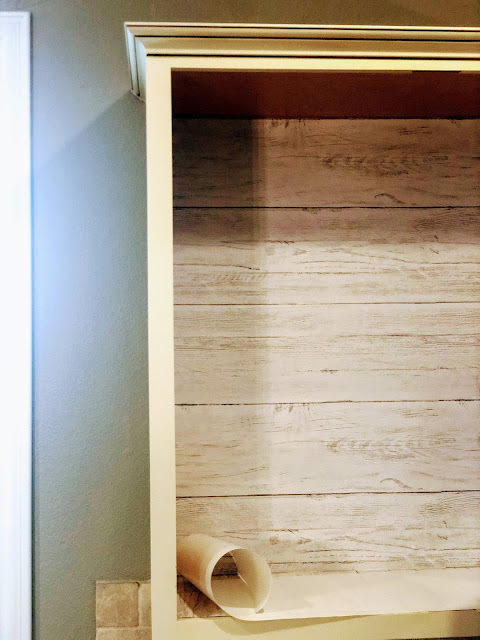 I really thought I was going to have to paint my cream cabinets white but I think I love it just the way it is! 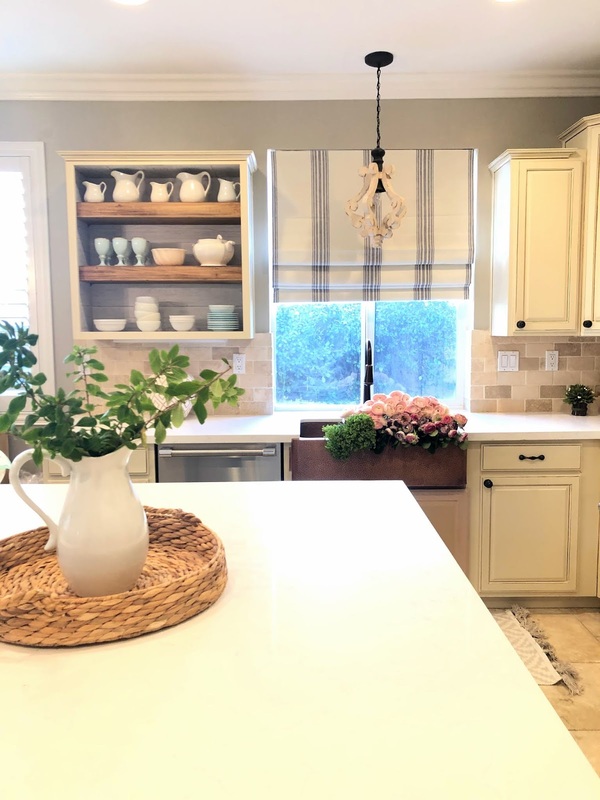 I have always loved creams and whites paired together and it is a beautiful combination in my kitchen. 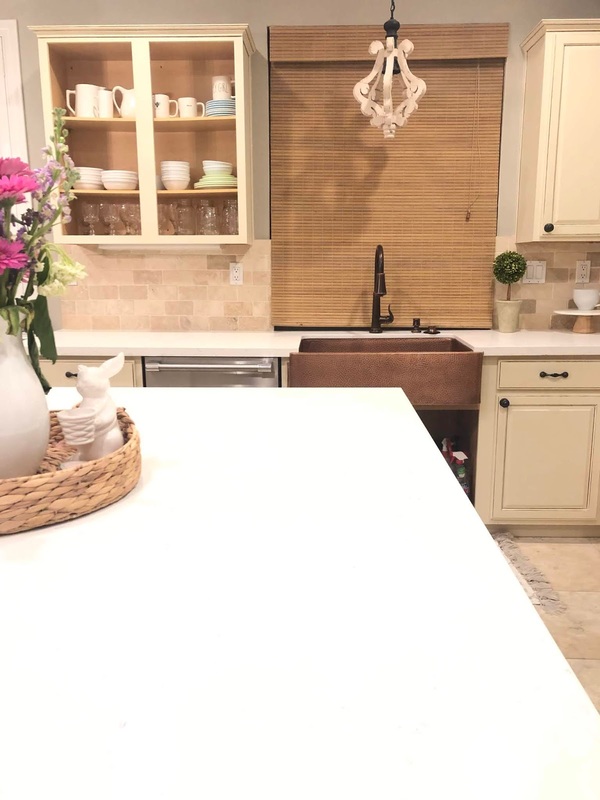 The backsplash really ties in the white quartz with the cream cabinets. The copper sink really adds a wow factor to my kitchen that I wanted. It's a focal point and your eye goes right to the sink when you walk in to the space. What a great way to add a little something extra to a space than with this sink! I guess you can tell I LOVE MY SINK! Also, I thought of another great feature of this sink and that is it's so beautiful that I don't want to leave any dirty dishes in it and so I do the dishes now as I go, not letting them sit in the sink! My husband really likes that part! 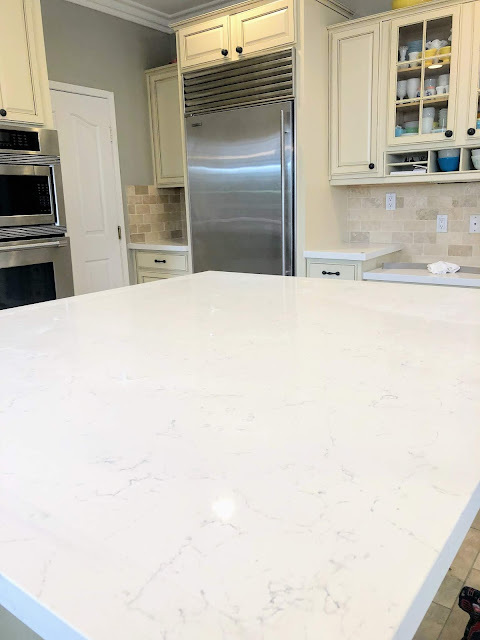 BELOW ARE THE FINISHED PICTURES OF MY NEW KITCHEN! ENJOY! 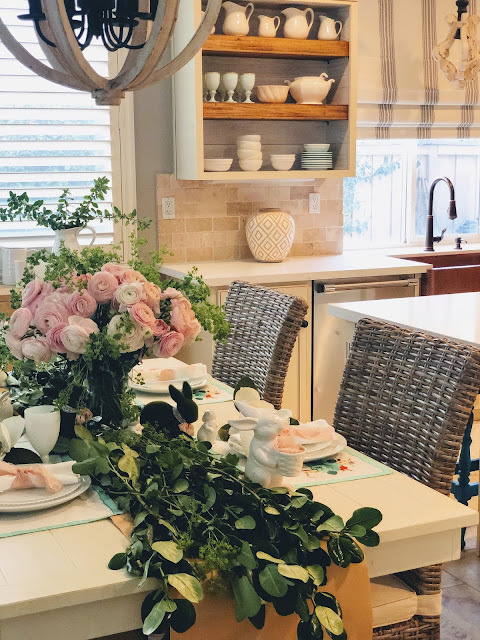 I HOPE YOU ENJOYED THE TOUR OF MY NEW KITCHEN! PLEASE LEAVE A COMMENT WITH WHAT YOU LOVED MOST! THANKS FOR STOPPING BY!